Preview: Easy Halloween craft for toddlers and preschoolers that also teaches shapes and colors! 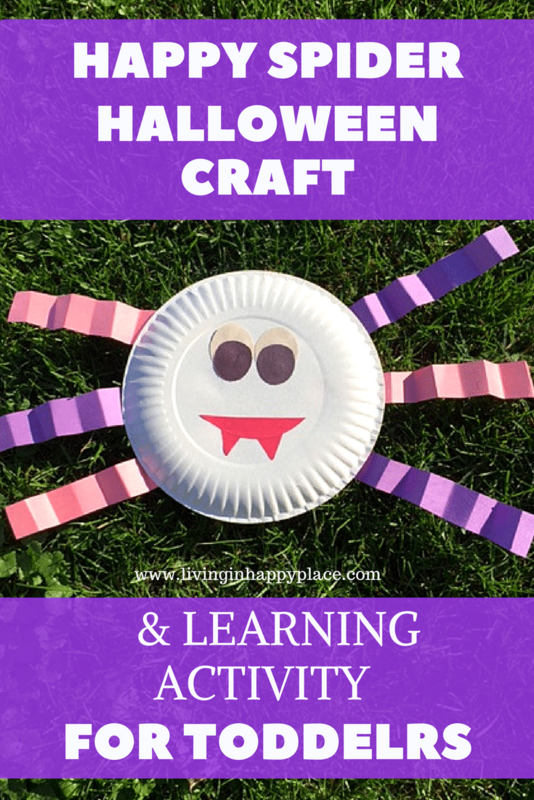 Looking for a Halloween craft kids can make? 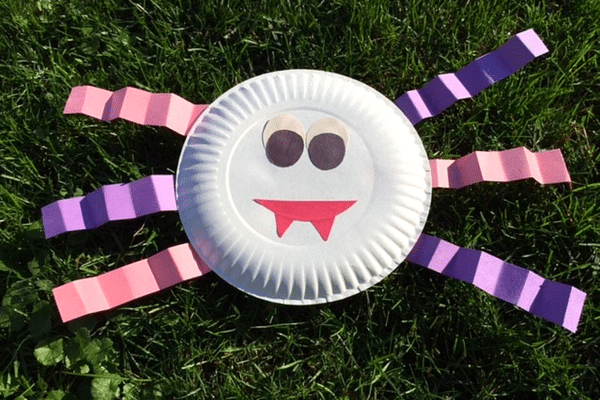 This simple “happy spider” craft is a great way to teach shapes and colors to preschoolers. It is also a great activity to build fine motor skills! Great craft for preschool Halloween parties, Kindergarten, or a kids Halloween party! 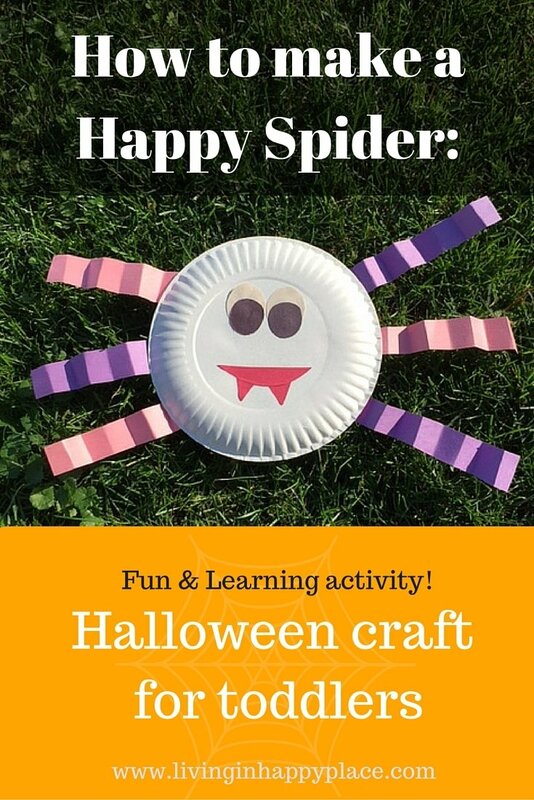 Preview: Super easy and fun spider Halloween craft for toddlers! Isn’t it so fun to share holidays with your children? I could not wait until my first baby was old enough to start painting pumpkins or try a Halloween craft for toddlers. Okay, maybe I started before she could really participate but I was just so excited to have a little miracle to share the fun with! We are working on making Halloween fun (and not so scary) for our 1 & 2-year-old by trying some easy crafts, books/movies, and snacks. They are still getting used to a holiday where we “celebrate” with monsters, ghosts, and spiders. This Halloween craft is really easy to make, assembles quickly, and uses items you probably have in your house. It is simple enough for toddlers to make (with supervision of course- glue sticks look a bit too much like lipstick and therefore a risk for “tasting”!). 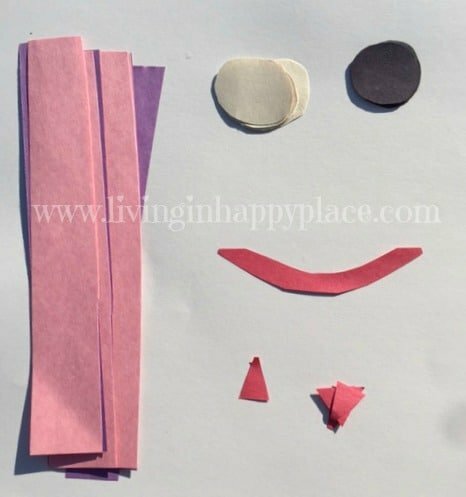 This is also a great activity for learning shapes and colors. -Pick a color (or 2 or 3!) for the legs and cut paper into strips. Pile strips together and fold accordance style then release. – Cut ovals/circles for the eyes. (I folded the white paper over several times to make multiple circles of the same size and shape). Next cut black circles for the eyeballs. They should be a bit smaller than the white circles so they fit inside to make eyeballs. -Cut a mouth shape and several triangles for “scary teeth”. -Using a glue stick, put some glue on the flat part of the “leg” and glue to the back of your paper plate. Add as many legs as you like!!! -Next, use the remaining shapes to make a silly spider face. I made a red mouth and added a few “sharp” teeth. Let the kids express their creativity! Maybe their spider has a mustache or scary eyebrows. 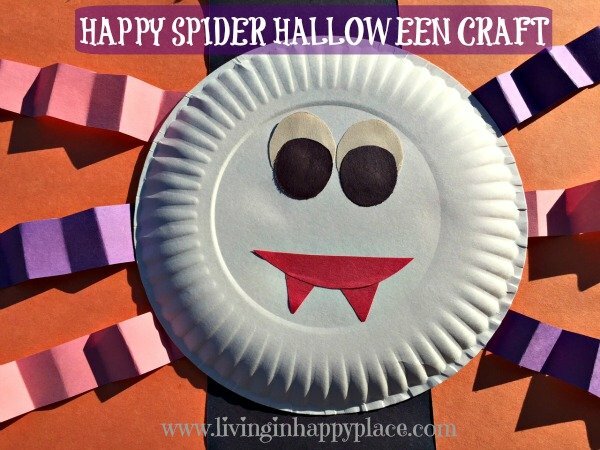 You could easily cut out eye shapes and add a string to make this into a silly spider mask! These little moments make a big impact on their education, love of learning, and emotional capacity. Who knew Mommy-and-Me time could be beneficial and fun?! Have fun and make it your own. Spending this time together with your child working on a Halloween craft is also a great time to prepare them for what they might see while they are out trick-or-treating or at Halloween parties. A little bit of open communication could make a big difference in turning a potentially scary experience into some holiday fun! Here is a link to the American Academy of Pediatrics Halloween Safety Tips . 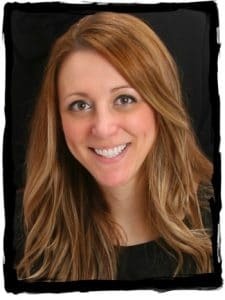 They had a lot of great tips that I hadn’t even thought about! What is your favorite Halloween craft to make with your toddler?